Oddly entertained by Hong Kong supermarket. When Colin travels, he enjoys checking out the local grocery store. We obviously passed plenty of smaller markets, but were most entertained by the gourmet supermarket attached to luxury malls like Harbour City: Citys' Super. Everything seemed to be jumbo-sized, sometimes categorized oddly, and very well organized. The wine and liquor section was nicer than I've seen in any other supermarket, and the kitchenwares section sort of reminded me of Muji. Some proof below. Meticulously organized and scrumptious-looking cuts of meat. 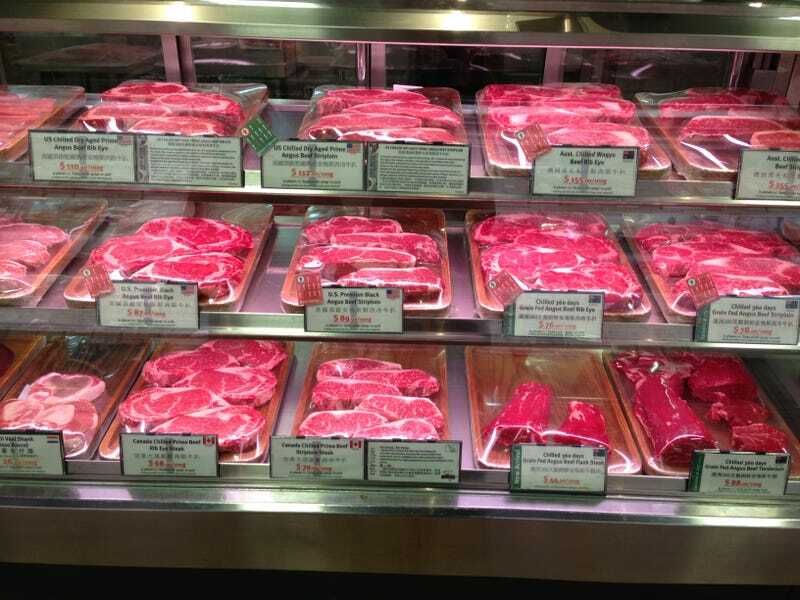 All of this meat was actually from the US, but we've never found it presented in this way. Colin was pissed/jealous. Ok, I should have put these carrots next to something else to provide scale/perspective. Trust me, these were abnormally large. Sort of like when you buy grapes from FreshDirect – they're on steroids! Everlane shows you how they make the Perfect Tee.